By: Guido, Sarah, Mueller, Andreas C.
Machine learning has become an integral part of many commercial applications and research projects, but this field is not exclusive to large companies with extensive research teams. 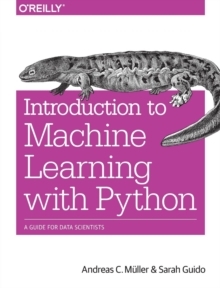 If you use Python, even as a beginner, this book will teach you practical ways to build your own machine learning solutions. With all the data available today, machine learning applications are limited only by your imagination. You'll learn the steps necessary to create a successful machine-learning application with Python and the scikit-learn library. Authors Andreas Muller and Sarah Guido focus on the practical aspects of using machine learning algorithms, rather than the math behind them.